This page shows tables of registered trademarks, brands and informal trademarks, and logo images used by various tool companies. 03/22/2019: Added Hinsdale "Bob Cat" trademark. 02/23/2016: Added Klein Tools "XELA" trademark. 01/30/2016: Added MAC Tools trademark. 01/20/2016: Added Enderes trademarks, removed Tru-Fit as Lectrolite brand. 12/13/2015: Added long-sought Hinsdale trademark! 11/27/2015: Added some Barcalo and M. Klein trademarks. 11/17/2015: Added early trademarks for K-D Manufacturing. 11/16/2015: Added a newly-found trademark for Champion Tool. 11/13/2015: Expanded fields in trademarks table to include filing and issue dates. 11/12/2015: Added Zenel trademark for Bonney. 01/12/2012: Added Fulton trademark for Sears Roebuck. 03/16/2011: Added Toho Koki Company HIT-Gear Logo. 03/05/2011: Added Three Peaks Giken Company 3-Peaks Logo. 02/23/2011: Added Craftsman Y-Circle Logo. 12/18/2010: Added Page-Storms PS-Oval logo. 12/14/2010: Snail Brand attributed to Thomas Smith & Sons (England). 12/10/2010: CFT-Oval attributed to Herbrand. 12/07/2010: Added Stix-On and Vitalloy trademarks. 12/06/2010: Added California Tool CT Logo. 10/16/2010: Added Craftsman AZ-Circle Logo and Larson L-Hex Logo. 10/08/2010: Added Chicago Mfg. CH-Logo. 08/02/2010: Added Syracuse Wrench SW-Hex Logo. 06/09/2010: Added Utica 3-Ovals Logo. 05/20/2010: Added Whitman & Barnes WBCo-Diamond logo. 05/11/2010: Added FH Ayer A-Circle logo. 09/18/2009: Added Starrett S-Circle logo and Whitman & Barnes W+B-logo. 09/04/2009: Added ACT-Circle logo, an unknown forgemark. 07/18/2009: Added Gripso trademark, PL-Diamond Logo, OT-Circle Logo, and USMC-Script Logo. 04/16/2009: Added Iroquois, Matchless, and Suregrip brands. 03/17/2009: Added Superslim brand and TW-Circle Logo. 01/29/2009: Added Bonaloy, Old Forge, and Tomahawk trademarks, BESCO trade name. 07/13/2008: Added CSCO forge mark. 06/09/2008: Added Williams JHW-Forged Logo. 02/25/2008: Updated trademarks for Thorsen. 02/12/2008: Added forge marks, identified the RI-Circle Mark. 02/11/2008: Added the DIF Forge Mark. 12/08/2007: Added the CTCo Logo. 03/09/2007: Added "Auto-Kit" and "Bet'R-Grip" brands. 02/19/2007: Added "Vacuum Grip" and "True-Fit" brands. 01/08/2007: Added the H-Shield logo. 12/16/2006: Added the OTC-Shield and PEXTO-Oval logos. 11/09/2006: Added Walden WMCo logo. 10/01/2006: Added Diamond Diamond-Horseshoe logo. 09/27/2006: Added Bonney B-Hex logo, used on Bon-E-Con tools. 09/24/2006: Added Armstrong A-Triangle logo and Williams JHW-Brooklyn logo. 09/04/2006: Added Craftsman H-Circle logo. 08/30/2006: Added Utica 3-Diamonds logo. 07/20/2006: Added Vitalloy brand of Billings & Spencer. 06/19/2006: Added Tomahawk brand of Walden-Worcester. 06/13/2006: Added Zenel and Bonaloy brands. 06/11/2006: Added Bonney CV trademark. 05/26/2006: Added ChromeXQuality brand, used by Western Auto. 05/24/2006: Added Grip-O-Matic, Push-Puller, and Powr-Kraft trademarks. 05/15/2006: Added Adjusto, HeXo, and Nuggets brands. 02/12/2006: Added Blackhawk Arrowhead logo. 01/29/2006: Added Montgomery Ward "Master Quality" and MW-Logo. 01/14/2006: Added Duro D-Trapezoid logo. 01/12/2006: Added KTC trademark; added Craftsman K-Circle logo. 01/04/2006: Added Wizard and Westcraft trademarks of Western Auto; added S-K Diamond logo. 12/11/2005: Added Bonney B-Shield logo. 12/02/2005: Added OTC and Truth trademarks; added Norivell brand. 11/15/2005: Added "Allenite", "Riverside", and "Thorsen" trademarks. 10/30/2005: Added "Blue Grass", "Blue Line", "Diamond", and "Sparta" trademarks. 10/29/2005: Added P & C logo. 10/26/2005: Added None Better NB-Circle logo. 10/25/2005: Added table of brands and informal trademarks. 10/13/2005: Added several more tool logos, fixed navigation links. This page will present tables of trademarks, brand names, and logo images. These are closely related concepts that define the way a company presents its products to the public. Registered trademarks, as the term implies, are words, designs, or images that have been granted trademark status by the U.S. Patent and Trademark office (USPTO). The trademark records maintained by the USPTO are publicly available and can be searched in their online database. In particular, the USPTO TESS system allows structured searching of database fields, and the TSDR system retrieves trademark documents based on the registration (or serial) number. In a few cases a company may have claimed a particular name or phrase as a registered trademark, but no corresponding registration could be found in the USPTO TESS database. In some of these cases we have been able to locate the trademark using a Google Books search for the published registration in the USPTO Patent Gazette. In the event that no public record can be found for a claimed mark, it will be included instead in the later section listing informal trademarks. In the table below, the Company column is generally the entity name that filed the application. In the case of name changes or mergers, trademarks representing the same product line may be listed under different entity names. The Reg. column gives the 7-digit registration number, with leading zeroes as needed to match the format expected by the USPTO TSDR system. The First Use column gives the date of the first public use of the mark, as provided by the company with the application. These dates were generally not subject to validation and may be rough estimates in some cases, especially if the trademark application was filed long after the first use date. Note that the table is sorted first by company name, then by first use date, and finally by registration number. Herbrand 0523089 11/01/1921 08/26/1948 03/28/1950 Filed Bingham-Herbrand Corp.
Multiflex 0525634 11/01/1933 11/28/1947 05/30/1950 Filed Bingham-Herbrand Corp.
Sure Seal Bottle Capper Co. Indestro All Steel Capper 0156066 01/20/1921 09/10/1921 06/13/1922 First owner of "Indestro"
Truecraft Tool Co. Truecraft 0563957 12/30/1947 03/12/1948 09/09/1952 Assigned to AdvanTech division of Daido Corp.
Truecraft 0585763 12/30/1947 03/11/1953 02/16/1954 Assigned to AdvanTech division of Daido Corp.
United Greenfield Corp. Vulcan [logo] 0795106 01/24/1962 00/00/0000 00/00/0000 Registered after acquiring J.H. Williams Co.
Williams, J.H. & Co. W [diamond logo] 0104112 01/01/1884 04/05/1912 04/27/1915 Diamond outline enclosing a "W"
Williams [underline logo] 0517355 11/09/1924 09/11/1947 11/08/1949 Williams name underlined by "S"
In addition to registered trademarks, many tools are marked with words or stamped images serving as brand names or informal trademarks. In some cases, the maker may have claimed the brand as a trademark, but no corresponding registration could be found in the USPTO trademarks database. It's unclear whether these discrepancies are due to filed but rejected applications, or possibly lost or incomplete trademark records. Table 2 lists a number of word marks used as brand names or informal trademarks, with notes indicating the particular use. Indestro Super Indestro Mfg. Successor to "Super-Quality"
Master Quality Montgomery Ward Sometimes used as "Ward's Master Quality"
Table 3 below shows a number of logo images taken from various tools. In some cases these are also registered trademarks (as noted in the table), but in general the logos are simply informal marks chosen by the manufacturer to identify their tools. The "Shorthand" column is just a fanciful name assigned for convenience of reference; it doesn't necessarily correspond to what the maker would have called it. Certain logos are identified in the table as "Forge Marks", meaning that they appear as a raised symbol on a forged piece, having been incised into the forging die. 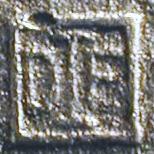 These marks were often used on contract manufacturing production to identify the maker. HP-Shield H-P Tool Mfg. Marked on wrenches with "Blue Line"
CFT-Oval Herbrand Found on pliers and wrenches. MW-Logo Montgomery Ward & Co.
OT-Circle Oswego Tool "T" Inside an "O"
V-Shield Vlchek Tool Yes "V" in a shield with small inner "T"
WMCo Walden-Worcester Initials for Walden Mfg. Co. The information in the registered trademarks table was obtained from the U.S. Patents and Trademarks Office (USPTO) at uspto.gov [External Link]. The specific systems used were the "TESS" database for structured searches and the "TSDR" document retrieval system. Logo images are from photographs of items in the Alloy Artifacts collection.